WASHINGTON, Dec 11 2013 (IPS) - In the midst of a nationwide movement for policymakers to raise minimum wages for millions of workers in the United States, experts here continue to debate the advantages and drawbacks of raising the federal rate. 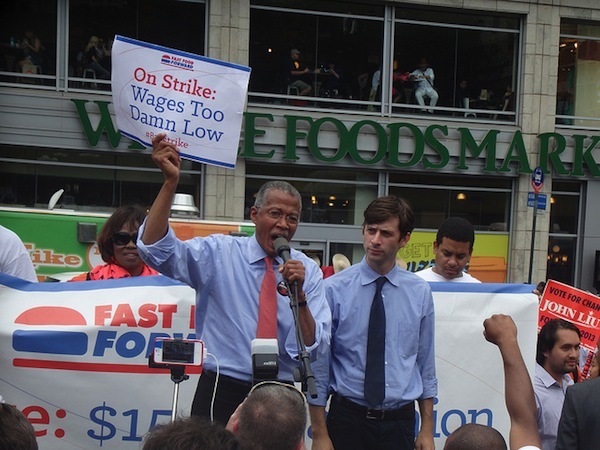 The push for higher minimum wages has gained momentum in recent weeks, particularly with strikes by low-wage restaurant workers last Thursday in more than 100 cities. President Barack Obama also joined the debate, delivering a landmark speech condemning income inequality and the “race to the bottom” where businesses try to “pay the lowest wages” possible. Obama’s renewed call coincided with a letter by 53 members of Congress calling on McDonald’s and other employers in the fast-food sector to raise pay for their employees. “Put[ting] more money in the hands of consumers…can help strengthen our economy,” the lawmakers noted. But while higher minimum wages are widely believed to have a positive effect on social conditions, particularly by easing poverty among the most vulnerable sectors of society, economists maintain varying views on the issue. "Raising minimum wages is not going to reverse inequality, but it does help [in] mitigating it." This is a phenomenon economists call “disemployment” or “job loss” – that is, when employers don’t lay off workers but simply stop hiring new ones while decreasing the hours of those who are already employed. Opponents of raising the minimum wage say doing so leads to an overall lower level of employed individuals and slower job growth. Despite strong opposition from many sectors of American society, including businesses and policymakers, some states have already started moving toward the president’s vision. According to the most recent statistics from the U.S. Department of Labour, 19 states plus the District of Columbia have a minimum wage that is higher than the federally mandated threshold of 7.25 dollars per hour. Washington state leads the country at 9.19 dollars per hour, while several others have proposals to raise some of these rates even higher. Others have recently raised their minimum wage, including California, Connecticut, New Jersey and New York. But experts say it is too early to establish whether these moves have had a sizable positive impact on low-income workers, and those who subscribe to the view that higher minimum wages could increase unemployment have used statistical evidence to prove their point. But Meer said this view may be too simplistic and that it ignores the larger trends that often hide behind the numbers. When trying to understand the relationship between minimum wage and employment, he said policymakers need to look at “the rate of job creation and job disruption.” When employers stop expanding their workforce, you get to job disruption, which is when employers stop hiring new workers because of the higher costs associated with their wages. Meanwhile, other economists consider the link between minimum wages and employment levels to be weak, and claims of higher wages leading to job loss simply “scare tactics”. What is really at stake, they say, are the poorest sections of society. “The biggest problem is that low-wage workers are falling further and further behind, and there’s a need to pull [them] up above the poverty line,” Sylvia Allegretto, the co-chair of the Centre on Wage and Employment Dynamics at the University of California, Berkeley, and a research associate at the Economic Policy Institute here, told IPS. Minimum wages, then, become more than simply a way to increase or decrease unemployment and instead are about inequality itself. In the United States, recent figures suggest that the wealthiest 10 percent of the population earn an average yearly income of over a million dollars, while the remaining 90 percent brings in just over 30,000 dollars. One tenth of the population controls two-thirds of the country’s economic wealth. She noted that a raising wage is likely to have very few negative effects, and would most likely benefit those at the very bottom of the wage scale. At the same time, the Berkeley economist recognised that there may be some disemployment risks, though she says these are largely negligible. “Even granting that there may be some small disemployment effects to higher wages, the benefits far outweigh the costs,” she said. But even if workers manage to mitigate the effects of fewer hours, critics of minimum wage laws note that the real problem is with those who fail to get hired. The divergence in the debate seems to hinge on the purpose of a minimum wage. For some, it’s about mitigating inequality. For others, it’s a matter of avoiding unemployment. Of course it will affect employment. Of course it will cause more inflation. You can not spend other peoples money and expect them to do nothing. Most people on minimum wage are being paid what they are worth!! Fast food was never meant to be a life time career!! If you want to make more get You a job that pays more!! This is one of the most effective ways that the system skews to making the rich richer and the poor poorer. When are people going to wake up and see this? I don’t care what you do, if you are working then you deserve to have a LIVING wage. Maybe they are working to the level they are being paid. I know if I was getting minimum wage, I would be giving minimum work for it. With jobs so scarce, then I imagine there are plenty of those minimum wage workers who are trying to feed and house families on it. The Rep talking points are not all true, you know; they are attempts to maintain the status quo where the rich are the main beneficiaries. The danger is that many will see low status jobs as perminate. These people will not upgrade their skills and will be replaced by technology. Thw foolishness of this is unbelievable. perminate? for some people a minimum wage job IS going to be permenant because thats the only kind of job they qualify for…..should they be punished for having bad genes and not being able to do well in school to get a degree to get a higher paying job? Punished? How is it punishment when that is what they qualify for?